"Whoa..." I thought, when I looked at the map of Golden Gate Park. I've been so used to the New Zealand definition of 'park', that upon seeing the size of this gigantic area of greenery, I imagined how many times it could fit Wellington city inside of it. One of the places inside of the park, a science museum called the California Academy of Sciences, was another place that came with the CityPass, so I thought I'd go there. Upon seeing the size of Golden Gate Park though, I thought I could easily spend my entire day just tucked away in that corner of San Francisco, so that's kind of what I did. I started with a little bit of a detour though. I took the bus only half-way across the city, because I had been looking-up where the supposed Full House house was. You know, the one off that old sitcom that you may or may not have grown-up with. Some friends back home had been bringing it up quite a bit in the weeks leading-up to my departure, so I thought I'd at least give it a visit. After wandering through some neighbourhoods, I did find the place, but unfortunately the current owners weren't very happy with all the attention that was being brought upon it, and not only sold the red door to their neighbours, but also put up a small gate and 'no trespassing' signs. It didn't look very accommodating, or happy, so I marked my location on Foursquare - just to prove in some way that I had been there - then moved on to the park. Coming in from the east, this was the first part of the park that I encountered. 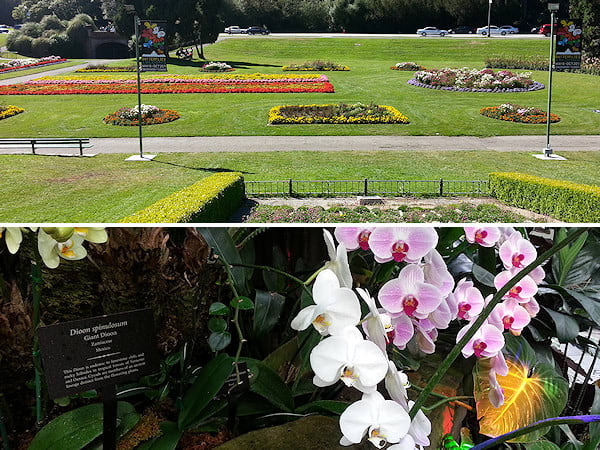 The surrounding area reminded me quite a lot of Wellington's own Botanic Gardens, except sooooo much bigger. Entire swathes of land were dedicated to flower and garden displays, and just like Wellington's gardens, there was a large greenhouse dedicated to tropical plants. 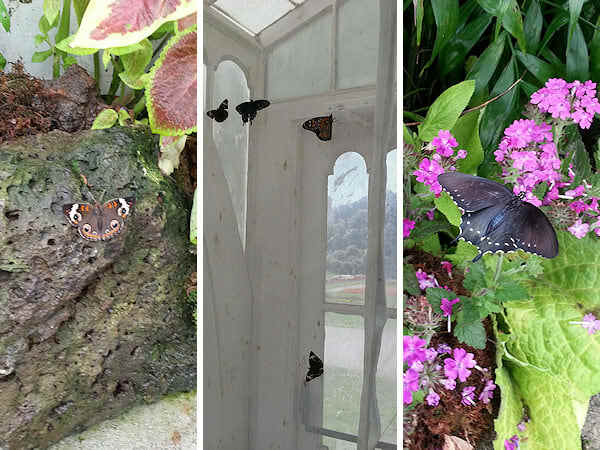 Walking through a simulated tropical climate probably wasn't the smartest thing to do after walking across a large city on an already hot day, but on the other side of one of the wings of the greenhouse was something we didn't have back home: a butterfly room. I followed what looked like a school group into that room, overhearing the precautions given to the children before they entered: be careful where you walk - you might step on one of the butterflies. I thought it was a cute little joke they used on the children. Turned out they were far from kidding. The entire room was filled with butterflies - all sorts of colours and patterns on the wings that I had never seen before - and many of them had taken to just chilling on the ground. It took me years to stop looking at the ground when I walk, and I still find myself mentally reminding myself to raise my eyes from the ground when I walk to make sure I don't miss too much, but in that room I found myself ignoring that advice and watching every step I took to make sure I didn't kill something under my stride. At one point, some butterflies blocked one of the doors to leave the room, and a group of those school children from earlier were blocked from leaving - they just stood there, looking down at the butterflies, not knowing what to do! When we did finally get out (we had to start encouraging the butterflies to move by waving frantically at them since we were told not to touch them), I left the greenhouse and continued my walk further into the park.